Provide due diligence services in support of buyer-side interests for a commercial property transaction. Brownfield Science & Technology, Inc. (BSTI) provided due diligence consulting services on behalf of a potential buyer of a restaurant property. During its Phase I Environmental Site Assessment (ESA) of the property, BSTI noted an absence of sufficient closure documentation for a former heating oil tank located beneath the building basement. A limited Phase II ESA was performed by BSTI involving the collection of sub-slab vapor samples to screen for the presence of volatile compounds potentially related to a release from the tank. Analytical results from the sub-slab vapor samples did not detect indications of a release of heating oil, however, elevated concentrations of tetrachloroethylene (PCE) were discovered. PCE, a carcinogen, is often used as an ingredient in degreasing solvents and in dry-cleaning processes. 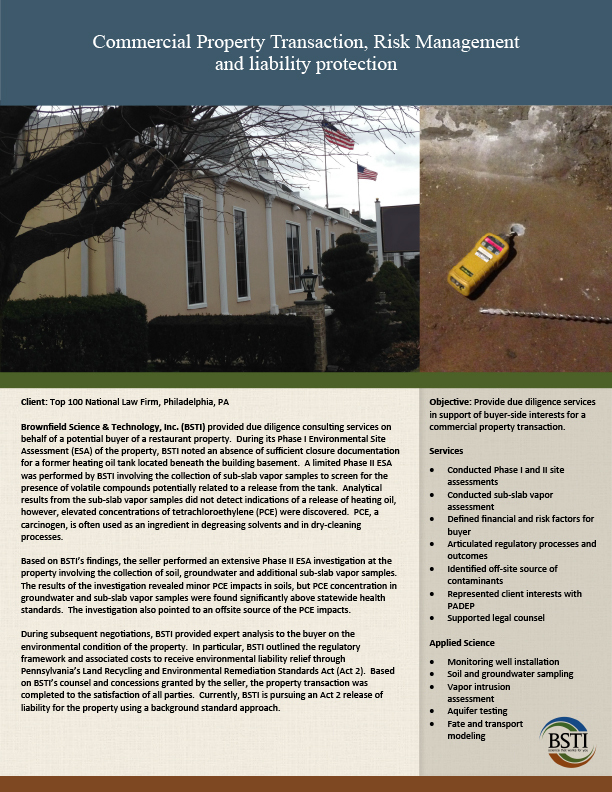 Based on BSTI’s findings, the seller performed an extensive Phase II ESA investigation at the property involving the collection of soil, groundwater and additional sub-slab vapor samples. The results of the investigation revealed minor PCE impacts in soils, but PCE concentration in groundwater and sub-slab vapor samples were found significantly above statewide health standards. The investigation also pointed to an offsite source of the PCE impacts. During subsequent negotiations, BSTI provided expert analysis to the buyer on the environmental condition of the property. In particular, BSTI outlined the regulatory framework and associated costs to receive environmental liability relief through Pennsylvania’s Land Recycling and Environmental Remediation Standards Act (Act 2). Based on BSTI’s counsel and concessions granted by the seller, the property transaction was completed to the satisfaction of all parties. Currently, BSTI is pursuing an Act 2 release of liability for the property using a background standard approach.